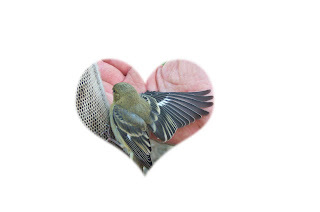 This weeks response to 2things photo challenge Love/Bird. 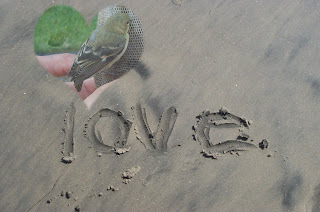 and as you can see we have plenty of birds to love. another pic of our wild finch. My husband is placing him on the thistle bag. This baby hummingbird is no bigger than one inch and he's perched in his nest in our Queen Palm eagerly awaiting his mother's return. For those of you who have seen my earlier post, here's another shot of our little wild finch who spent two weeks visiting us and landing happily in our hands. This photo was taken from inside the house. 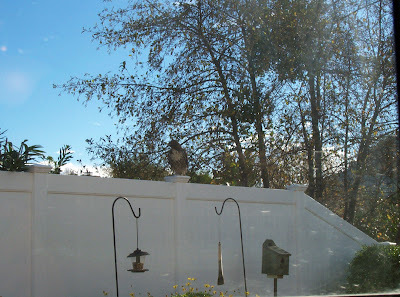 Can you see the Red Tail hawk perched on the fence, he's patiently waiting for a family of Quail to emerge from the shrubs. This pic doesn't do this bird justice he's well over 18" in size. I went outside and eventually scared him away so I would not have to endure a Quail massacre. and what we have here are five baby Western Bluebirds. We had 6 eggs and one never made it. We watched these birds from from the time the parents set up camp until the time they fledged. We have Western Bluebirds visiting all the time and hope we'll see more mating soon. Have a wonderful day! Thanks for the visits. What a wonderful post, with wild life and art! I hardly ever see a bird or anything interesting. My sister and I saw a squirrel the other day and that was quite a big deal, it was a red squirrel. I think we have the odd bird in the neighborhood, but nothing exciting, although my sister did have two doves in her tree one spring. Finches are becoming a rarity, but we do see a lot of crows that are quite feisty. We have a bird identification book, but we live in town, so there isn't that much to identify. The whole area has been built up and there are no field mice any more to be caught. The cats used to bring them home all the time, but not anymore. They are all gone. We don't have anything exotic here, unless you think a pigeon is, we have too many of them in town. Pigeon poop everywhere. What a wildlife sanctuary you live in - goldfinches, western bluebirds, Californai quail and a baby hummer (not the car). The red tailed hawk is the most common hawk in North America - a generalist that can hunt rodents or birds. A pair nest on Fifth Avenue in Manhattan on coop building where Mary Tyler Moore lives. The male is called Pale Male and there are books and a documentary film on him. Been there at least ten years. I just love seing bluebirds more common in NY than they used ot be due to nest boxes. Last ones I saw where a pair in the Everglades last April - Eastern Bluebirds. I would love to see that baby hummingbird. One of the many lovely things about moving to SoCal is the birds, especially the hummingbirds. The building we live in has lots of flora around it, filled with birds I didn't grow up with in the midwest. So delightful, year round bird songs! I agree with the comments. You are privileged to live in such a wildlife haven, and especially to have them actually landing on your hand! They must be very trusting of people. These are wonderful pictures!! Your entry rocks! How great to see these birds and have them around. Thank you! What a lucky person you are to have this little bird come to you on it's own. A moment from heaven I would think. The birds I see here in East Texas seem to be a bit wilder but I do feed them and have a constant drip of water for them. The enrich my life and I can see they do yours too.